While 24 h exposure of sheepshead minnow fish larvae to purified monogalactosyl diglyceride (MGDG) lipids, containing octadecapentaenoic acid (OPA) exclusively or as a mixture of octadecatetraenoic acid, eicosapentaenoic acid, and OPA (OTA-EPA-OPA), caused sluggish swimming and gulping, it produced no mortalities even at concentrations up to 120 mg l–1. In contrast, comparable concentrations and exposure times caused significant reductions in viability of rainbow trout gill cells. Pure EPA was the most harmful to gill cells (up to 98.5% viability loss in 60 h) followed by OPA-rich MGDG (45% loss), with OTA-rich MGDG (37% loss) the least toxic. 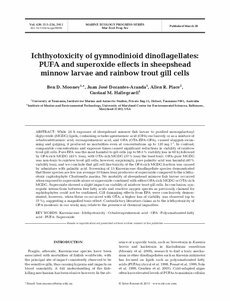 OPA-pure MGDG was non-toxic to rainbow trout gill cells; however, surprisingly, pure palmitic acid was harmful (40% viability loss), and we conclude that gill cell line toxicity of the OPA-rich MGDG fraction was caused by admixture with palmitic acid. Screening of 15 Kareniaceae dinoflagellate species demonstrated that these species are low (on average 10 times less) producers of superoxide compared to the ichthyotoxic raphidophyte Chattonella marina. No mortality of sheepshead minnow fish larvae occurred when exposed to superoxide alone or superoxide combined with either OPA-rich MGDG or OTA-rich MGDG. Superoxide showed a slight impact on viability of rainbow trout gill cells. In conclusion, synergistic interactions between free fatty acids and reactive oxygen species as previously claimed for raphidophytes could not be confirmed. Gill damaging effects from EPA were conclusively demonstrated, however; when these co-occurred with OTA, a higher loss of viability was observed (up to 37%), suggesting a magnified toxic effect. Contradictory literature claims as to the ichthyotoxicity of OPA (nontoxic in our work) may relate to the presence of chemical impurities.